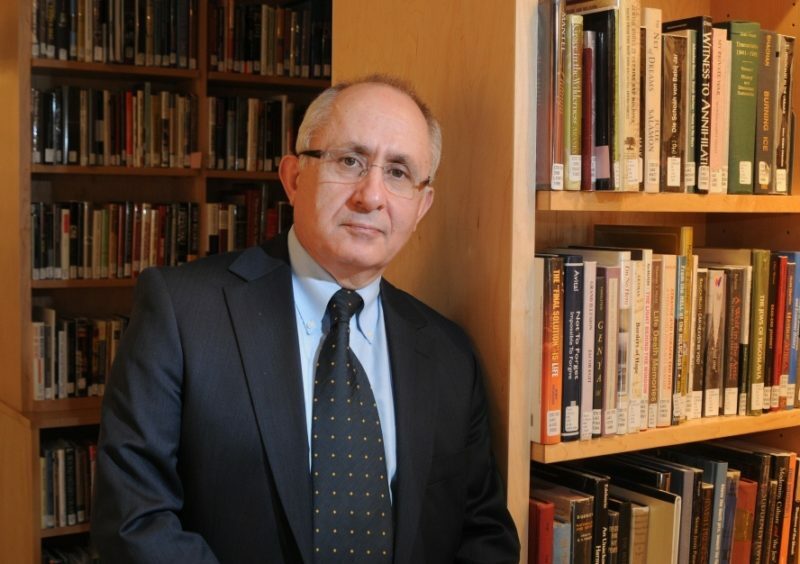 Taner Akçam is a Turkish historian and authority on the Armenian genocide. A 2009 raid against the ultranationalist terror organization Ergenekon, whose members were linked to Turkey’s military and security forces, uncovered a list of “Traitors to National Security,” which named Akçam, as well as Turkish-Armenian journalist Hrant Dink. Dink was murdered in 2007. Akçam’s latest book is The Young Turks’ Crime Against Humanity: The Armenian Genocide and Ethnic Cleansing in the Ottoman Empire. Q: Almost one third of the 17.5 million inhabitants of Anatolia in 1913 were displaced, expelled, or annihilated over the subsequent six years. What happened? A: The main reason was the continuous decline of the Ottoman Empire. The Ottomans wanted to solve this decline, and one of the ways that they thought of was to change the population structure of the entire empire. The major problem for them was the Christian population. After they lost the Balkan War of 1912, they decided to get rid of the Christians. There were two ways of getting rid of them. One was to expel them to Greece. This was possible in the case of the Greeks. In the case of the Armenians, they decided to relocate them entirely to the Syrian and Iraqi deserts. The non-Turkish Muslim population was also targeted. They were redistributed throughout Anatolia with the purpose of assimilation. They had to be assimilated within Turkish culture. Against Greeks, there were occasional massacres. But the main goal was to remove them from Anatolia. In the case of the Armenians, there were two major issues that made the policy toward them genocidal. There was no country where they could send them. Second, there was a reform agreement, signed February 1914, according to which two semi-autonomous provinces would be established on historic Armenia, today’s eastern Turkey. The Ottoman authorities never wanted to implement this plan. They knew this would be the beginning of an independent state of Armenia. So the Ottoman authorities used the war as a cover and solved the Armenian problem with a genocide. Q: How many Armenians were killed? A: Between 800,000 and 1.3 million. Eight hundred thousand is the number of the Ottoman authorities. They gave this number officially in a press conference in May 1919. I think it’s around one million. After 1919, the massacres and killing against Armenians continued in the Caucasus. If we include this, we will arrive at a number around one million. Q: The Ottomans felt the Armenians were a threat to the survival of the empire? [of the population in any given area]. This was a decision they made, and they worked very hard to implement this. Q: But Armenians were deported from areas that were firmly under Ottoman control during the war, and ultimately massacred. Why? A: They explicitly wrote that the existence of the Armenians as an ethnic and religious community could make it possible for them to raise their demands. So their numbers should be reduced over all of Anatolia, reduced to a number so that they could never be capable to raise certain demands for themsleves. Their group existence must be destroyed. Q: Were the Ottomans right? Did large numbers of Armenians in Anatolia threaten the empire? A: There was not an objective threat. I can give you one example. 1915, when the Russian Empire came within 30 to 40 kilometres of Erzurum, an Armenian city, none of the Armenians organized any uprising to unite with the Russians. We also have reports from Ottoman governors, especially in 1914, reporting to the central government that there is not much movement among the Armenian population. Q: A gendarmerie commander, Mustafa in Bogazliyan, explained to an Army Corps acting commander that the Armenians had been killed “because they were vermin.” Was this element of perceived racial superiority an element motivating the genocide? A: I personally don’t think that they followed any racial ideology. There was a religious contempt. They disdained Armenians as a religious group. But it was not described in racial categories. They didn’t hesitate to assimilate Armenian girls and children in Ottoman households. Q: Hüseyin Nesimî, a senior regional administrator, refused an order to massacre his Armenian residents. He was summoned to Diyarbakir and murdered en route. Was this sort of defiance common? A: Unfortunately this is not a well-researched area. I can tell you based on my own knowledge that it was not an isolated instance. Q: How important were the Ottoman archives to your work? A: They are very crucial. I think I was able to show that the Ottoman archival material confirms the information that we have from Western archival sources. It is important because it gives us the mindset of the perpetrators of these crimes. Those who decided to kill Armenians were not fanatics, were not some bunch of Islamic idiots or monsters or barbarians, but well-calculating, educated social engineers. Q: How is the Armenian genocide perceived in Turkey today? A: I think after the Hrant Dink assassination in 2007, there was a slight shift in the attitude of society. You can publish and write on the Armenian genocide freely. The topic has been extensively debated. Even the public commemoration of the Armenian genocide is possible. The Turkish government officially denies still, basically because of political reasons, especially because of their relations with Azerbaijan. In every state university there are professors producing materials to support official Turkish lies. An official brainwashing operation, I would call it. The Ottomanists and historians working on Turkish history consciously ignore this topic, as if such an event never happened. And I consider this as a huge and very serous intellectual problem. If you ignore the killing of hundreds of thousands of people in one country and continue to be a historian, and analyze the sociology and political structure of that country, I consider this really a big crime. Q: You say this makes future mass crimes more likely. A: Of course. Because this means impunity. Even in public discourse, even in intellectual discourse, there is no moral critique of killing hundreds of thousands of people. It is something normal. It can be done again. Q: You write that the widespread conception of the Jewish Holocaust as the benchmark for what constitutes genocide has clouded our interpretation of the Armenian genocide. What do you mean? A: Everybody tried to bring their case as close as possible to the Holocaust. And if your case was not similar to the Holocaust, one would argue that it could not be called a genocide. So you ignored certain social dynamics of your own case in order to bring it close to the Holocaust. In the case of the Armenian genocide, for example, there was a systematic assimilation policy. Armenian children were taken away from their homes and put in Muslim households. In the Holocaust, assimilation was never a policy against the Jews. Q: How did you feel after you discovered your name was on the Ergenekon list of traitors? A: This was the reason why I couldn’t go to Turkey after Hrant’s assassination. The assassination was a product of this group. I have to give credit to my government. They put all these generals and other extreme nationalist fascists in prison. Q: You’re one of the few Turkish scholars who tackles this topic. Why do you do it? A: It’s very simple. If you want to have a democracy in our country, you have to face your own history. Without an honest reckoning of what happened in the past, you cannot create a peaceful future. Q: Do you regret doing so, given the resulting threats against you? A: After Hrant’s assassination, we never ask this question of ourselves, other Turkish intellectuals also. We owe this man a lot, and we have to continue fighting the denial policy of the Turkish government.